Joshua's Girl: And then she was THREE! We celebrated Evie's 3rd birthday! I am in denial. She should still be my teeny tiny baby. But, she has grown into the sweetest little firecracker. She loves her momma and daddy, her grandparents, her sissy, and going shopping. 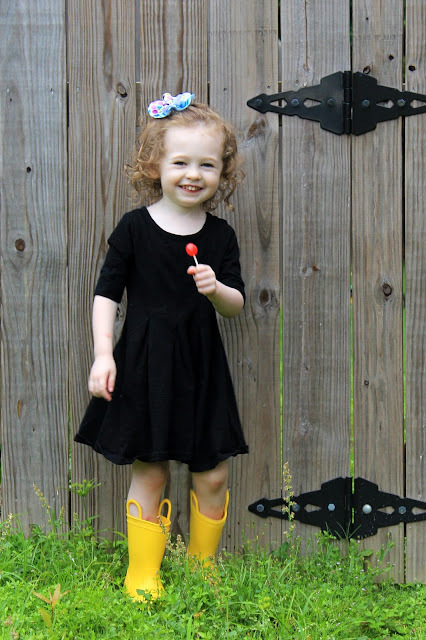 She also loves her yellow rain boots and jumping in muddy puddles (thanks to Peppa Pig!). Her favorite thing to eat right now is french fries, cake pops and peanut butter and jelly sandwiches. She loves to learn and her favorite color changes daily. We love her so much. I'll share pictures from her party soon! WOW, 3 already?! She is a doll.